I hope this post isn’t too late yet. Thing with juggling life with both worlds, the offline and the online, sometimes you felt like a deer in the headlights. I was too occupied in the past days packing relief goods and briefing volunteers for our psychosocial team that will be deployed to Samar and I was out of the online freeway for a while and when I hitched back I had to dig deep and get myself doses of information of what’s happening around blogosphere. The Davao Blogger’s community is also doing its share to help by coming up with 1,000 hygiene kits that will be sent to the typhoon survivors. Here’s an infographic of the anatomy of the hygiene kit. A conscious effort is now being undertaken by the Davao Bloggers Society to join the relief operations by raising a total of P100,000.00 to finance and produce 1,000 hygiene packs for the victims. 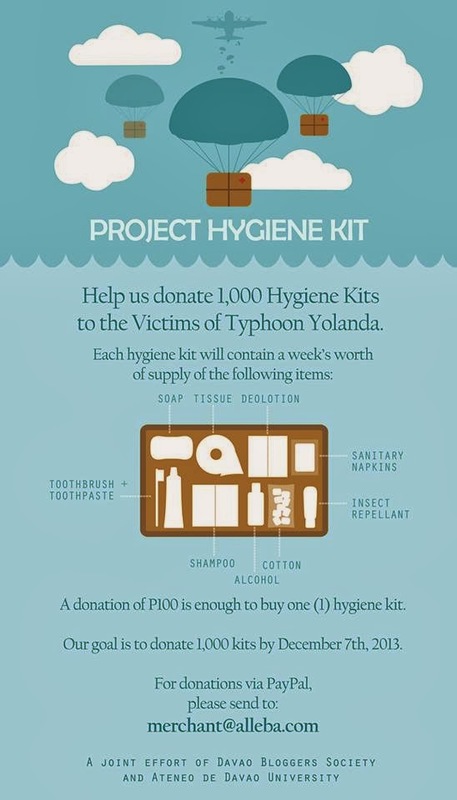 Each kit costing to PHP100 or USD2.50 will contain toiletries and other essentials good for one week's use by one person. Hygiene kits were chosen to be donated as this is something that is not yet prioritized by many donors. You may also send via PayPal to merchant@alleba.com Pledges for donation may as well be coursed through any member of the Davao Bloggers Society until December 7, 2013. All kits and other donations will be turned over to Ateneo de Davao University.